In the meantime, on several facebook sites such as "Pamir-News" (which are in the Pamirs often favoured to other kinds of media), several photographs, maps and figures on the Earthquake of December 7th are being circulated. Among them is the following table that concretely numbers the degree of destruction. The first two lines refer to the are of our project: The community of Savnob (Upper Bartang Valley, 10 settlements) and the Community of Basid (Middle Bartang Valley, 5 settlements). 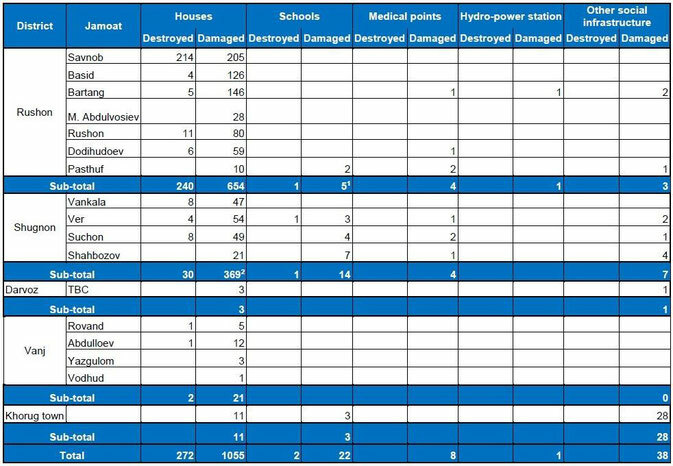 Numbering 214 totally destroyed and 205 damaged houses, the community of Savnob is the are most affected by the Pamir Earthquake of December 2015.